Why some buy hormones and injections from strangers and people on the street. Ivana Black sat nervously on a plastic-covered couch in the home of a stranger; a person she had never met and with whom she was trusting her life. She had driven almost 100 miles to get here. The 18-year-old was told the woman who lived here could get her the shots she needed. Ivana felt her life depended on it. An older woman wearing a nightgown-dress emerged and summoned Ivana to a bedroom. She told Ivana not to worry. But Ivana was terrified. Ivana watched the woman as she took out a syringe and the drugs for which Ivana had paid $40 in advance. Then Ivana turned around and bent over for the shot. This is worth it, she thought. The sting of the needle pierced her skin, and made her feel dizzy. It was the first of many gambles Ivana would take with black market drugs, drugs that she said allowed her to physically transition into the woman she is today. Ivana Black was assigned male at birth. Now 45 years old and living as a woman in New York City, she works part-time as an entertainer and an actress. She lives in West Harlem with her small dog, Angel. Ivana started transitioning in her late-teens while living in the Midwest. She began with birth control pills because, she says, they were the most accessible form of hormones at the time. 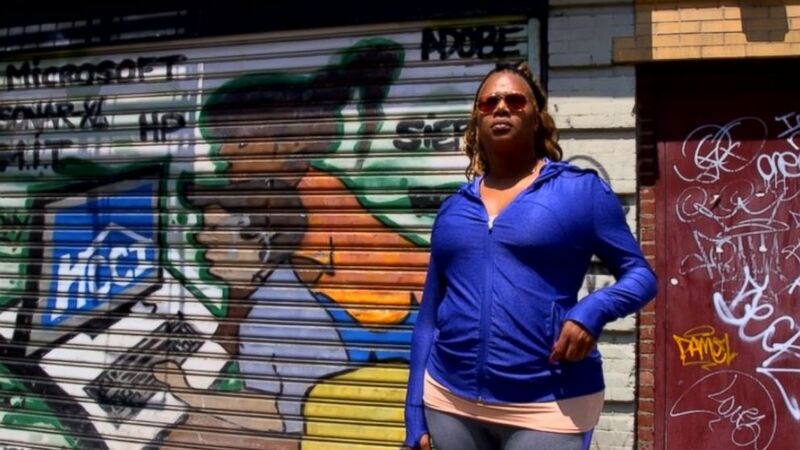 ( ABC News) West Harlem resident, Ivana Black, was assigned male at birth and has transitioned using black market drugs, June 2015. Ivana said she wanted to transition to a woman as quickly as possible. Faced with too many financial hurdles and finding difficulty in navigating the health care system, she turned to alternative means. For most of her life, Ivana says, she has used black market drugs, including hormones and silicone injections she bought from strangers or people on the street. While Ivana does use some legal drugs now, she still gets hormones outside her prescription because, she says, they can be stronger and she wants an extra “little boost” here and there. Transgender women take estrogen, often adding an androgen blocker that stops the body from producing testosterone. The hormones help change a person’s appearance, including body shape, breast development, hair growth and skin texture. People may use silicone injections to make their breasts or buttocks larger, and to make cheekbones have a more feminine appearance. Although health care laws have evolved since her transition started, many transgender people remain without health insurance coverage for transition-related care. Eight states and the District of Columbia now offer transgender health care under Medicaid, and 15 states and the District of Columbia require private insurance companies to cover transgender health care, according to the Transgender Legal Defense and Education Fund. “Insurance care is a patchwork and a real sore spot for transgender people, many who cannot access coverage for the care that they need,” Michael Silverman, executive director at Transgender Legal Defense and Education Fund, told ABC News. Dr. Zil Goldstein, who specializes in serving the LGBT community, and who has transitioned herself, said that even if a client has insurance coverage on paper, it can be a challenge to sift through the red tape to receive transition-related care. To be prescribed hormones, some providers require a psych evaluation and others still use a three to six month “real life experience” guideline, which means living as the gender a person identifies with, Goldstein said. Even with a prescription, patients can still face challenges. If insurance does not cover the medication, hormone prices range from $60 from a compounding pharmacy -- which creates drugs tailored to a specific patient -- to $400 if the client receives a brand-name estrogen shot. Oral hormones can be a lot cheaper, but there’s some evidence they are not as safe, Goldstein said. Some, like Ivana, turn to black market drugs. While it’s difficult to put a number on how many seek out services outside of the doctor’s office, Goldstein says, “a lot of people” go outside the medical system for these interventions. The costs of black market hormones vary widely. People will charge anywhere from $50 to $350 for a single shot of estrogen, Goldstein told ABC News. But using drugs without a doctor’s supervision can be dangerous. Although Ivana said she has no known health complications from using black market drugs, she knew people who weren’t as lucky. 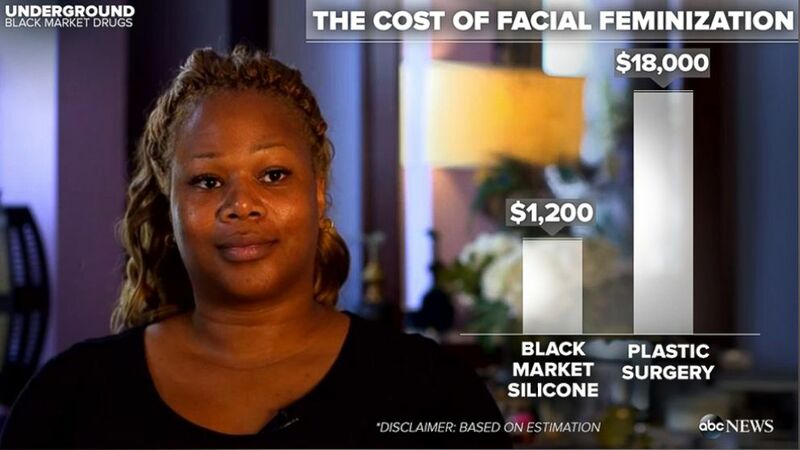 (ABC News) The cost of some black market drugs versus plastic surgery is seen here in this graphic. For those seeking to alter their body shape, silicone shots are often used as a cheaper alternative to cosmetic surgery. Also termed “silicon pumping,” the practice can be extremely dangerous, doctors say. After being injected under the patient’s skin, silicon can slip into the bloodstream. The injection itself is sometimes thinned with dish soap or motor oil before being injected into the body. In September, a woman in New York City died after having silicone injected into her buttocks. Four years ago, a dancer from London died after low-grade silicone traveled to her lungs.